In case of cancellation or if you do not show up, you have to pay: Deposit. By pressing the "Pay" button during the purchase process, the member declares to accept completely and without discretion all of these Terms and Conditions of Sale. There are no refunds of your guarantee of payment for cancellations of a period of 2 days before your arrival. The contractual information is presented in Spanish and / or English and will be confirmed to the client. In the prices of our services are included the taxes of services on the base rate. "VAT" "foreigners and Peruvians living abroad are exempt from this tax". Services will be billed based on the rates in force at the time of purchase. We reserve the right to refuse an order from any user with whom you have a dispute. 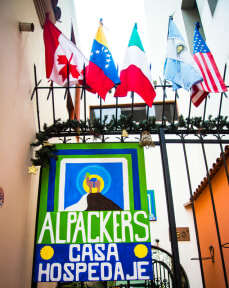 Alpackers is located 4 blocks from Kennedy Park, Alpackers ByB offers accommodations in Lima. Free WiFi access is available. Each room here features cable TV and some rooms have a private bathroom with free toiletries. At Alpackers ByB guests will find a 24-hour front desk, a garden and a terrace. Other facilities offered at the property include a shared lounge, a tour desk and luggage storage. The Alpackers is located in the center of Miraflores, only 3 blocks from the central park of Miraflores called Kennedy and 06 blocks from the Miraflores shore. Close to restaurants, pubs, discos, shops, cinemas, theaters, museums, galleries and also business and banking entities. The rooms and dorms includes a flat – screen TV with channels, security boxes, wardrobe/closet, free Wi Fi, private bathroom,etc. In addition, we have several common areas where the guests and travellers can exchange past experiences and future plans. The foreign passengers with their corresponding passport will be exonerated from the tax fee.